There are several ways to edit a shot in Photoshop and two of the most underrated yet highly effective tools are the dodge and burn tools. These are found at the toolbar on the left. 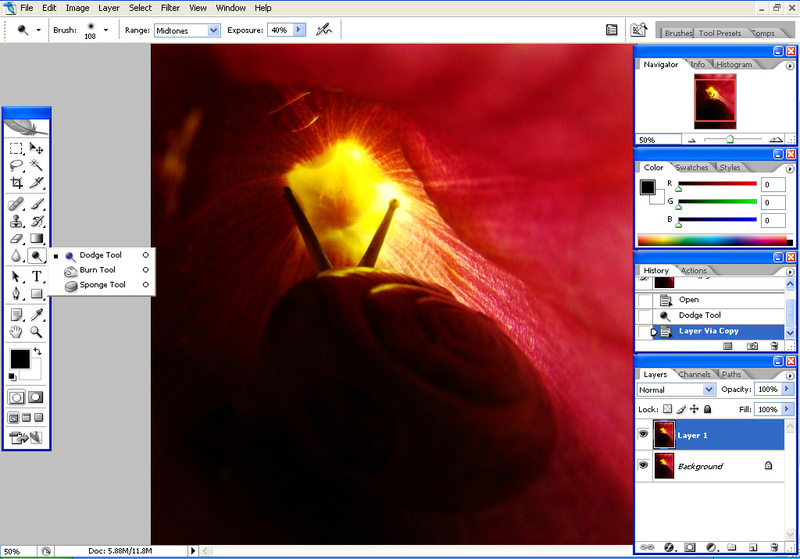 The default icon is the dodge tool and if you click on the little arrow, a dropdown list will appear showing the burn tool and also the—-.The dodge and burn tools are the digital equivalent of the methods used in the actual darkroom, where to 'dodge' meant to obstruct the light hitting a section of the photo paper from the —- with the use of an object. While to burn meant to allow more light to hit a specific section of the photo paper. Since one cannot really see the results until the image has been fixed with chemicals, the procedure would usually be trial and error with a lot of test prints involved. Now, digital technology has made it so much easier to achieve the visual results we want. Let us try out the dodge and burn method with a sample image. Open an image in Photoshop and make a duplicate layer. Pinpoint the areas that would need to be darkened and/or lightened. Let us start with the dark area. 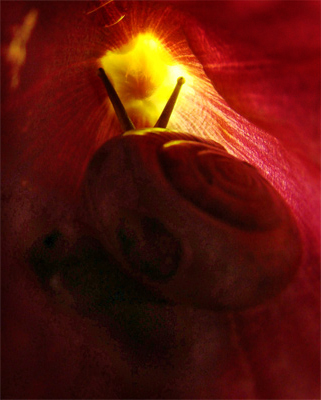 In this image, the bottom part of the snail's shell and the lower left corner are too much in shadow and it would be a good idea for a little more light to show more details. Click on the dodge tool and keep the hardness set to 0% so that the edge of your brush is soft. Set the diameter to a manageable size so you have better control of your strokes. As for exposure, choose a percentage that gives a subtle yet visible result. A high exposure value would mean a more drastic dodge effect. 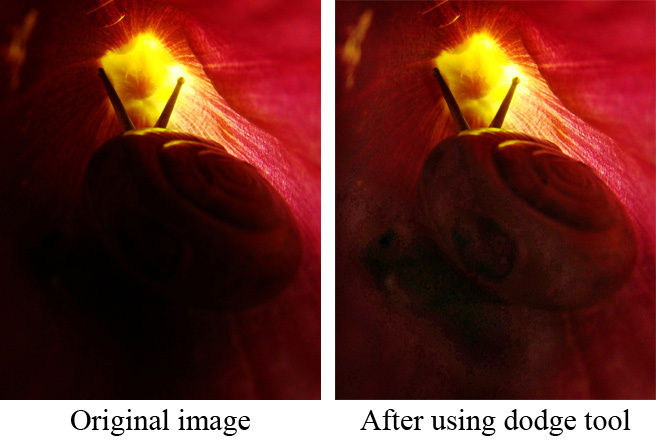 Use the dodge tool like a brush and swipe the dark areas until they are light enough. Next, choose the areas you want to darken such as the upper right corner. Burning would make that area more balanced in terms of tonal value. Click on the arrow on the dodge tool icon to show the burn tool option. Again, adjust the settings and swipe over the light areas until you are satisfied with the results. The burn and dodge tools are great for spot adjustments and using them can enhance the light and shadows in your photo by making the light areas appear even lighter and the shadows darker. They can also lessen the degree of light and shadow detail to make the lighting appear more even. This entry was posted on Thursday, August 18th, 2011 at 10:00 am	and is filed under Articles, Beginner Tutorials, Photography Tutorials, Photoshop Tutorials. You can follow any responses to this entry through the RSS 2.0 feed. You can leave a response, or trackback from your own site.